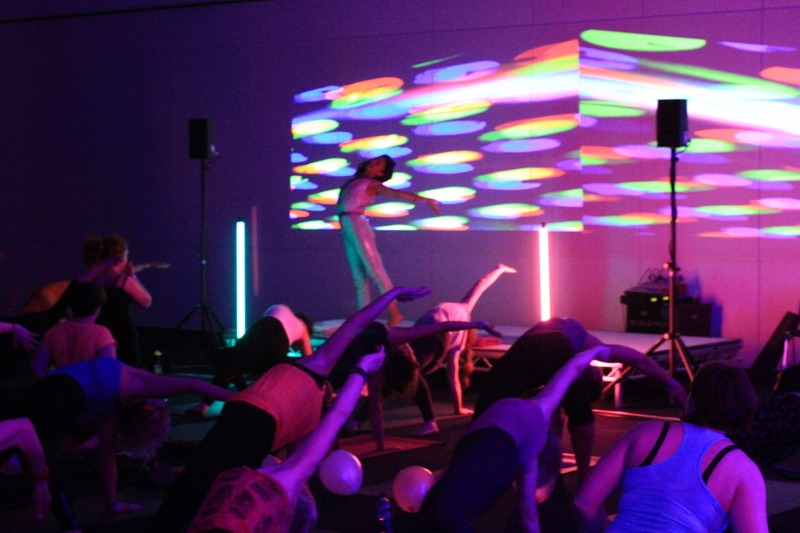 Yoga Disco at The Yoga Show Manchester // Pic & Video! Such an EPIC GANG! Thank you SO much to everyone who came to the Yoga Disco at The Yoga Show in Manchester on Saturday night! Still in utter rapture and admiration for such open, courageous and brilliant people! So inspired and honoured from the depths of my guts. Great to connect and hope to see you again! See below for a video of our shenanigans! Thanks also to The Yoga Show for letting us inhabit and take over the space and the technical support and stewards who were a pleasure to set up with. To Panther Panther! For awesome projections, patience, dancing and driving up from Bristol and back (not at the same time!). And Finemann Ketil Kinden Endresen for being my partner on the journey, letting me endlessly change the playlist, for guiding us through the set so skillfully and for filming and editing this brilliant film. Elskers. This entry was posted in art + yoga, inspiration, music, news, workshops & events, Yoga Disco and tagged art and yoga, dj, good people, Inspector Norse, inspiration, lazers, Manchester, Panther Panther, the yoga show, vj, yoga, yoga class, Yoga Disco, Yoga Everywhere, yoga Manchester, yoga music, yoga party, yoga with dionne. Bookmark the permalink. ← Newsflash: new yoga class in Brighton starts Wednesday!